Last April, Jerilock sent me a link to an auction for a Bullmark catalog that, in addition to some classic gokin, showed some strange King Kong items. One, a wind up walker, I was familiar with, but the others I had never seen before... .
First things first... ask around. I sent out an email to all the monster and vinyl guys I know. Nobody had ever heard of it and the general assumption is that it was never made, since the catalog is from Bullmark's last year. Next... ask online. The information I got back was that it was made, but without the spinner. Finally, one showed up on Ebay with an astronomical price tag and the claim that it was the only one made. Later, others would come to light. It WAS made and not just one. In fact, there even seem to be paint spray variations out there. So, what's special about mine? Well, the way I got it was insane. It was listed on Yahoo Japan as "Takara King Kong" and no mention of Bullmark. [The toy actually had THREE manufacturer names on it: Mego (who had the King Kong license in the US), Takara (who had the license in Japan), and Bullmark (who actually produced the toy). I think that's right, anyway...] With no Bullmark added to the listing, I thought it helped my chances to win, but of course I also realized that maybe the seller didn't realize it might be worth something. Therefore, I made an offer of 10,000 yen to end the auction early. The seller said he would not sell it outright and then added "Bullmark" to the item description. Dang! Now not only will I have to bid, but more people will find it, right? 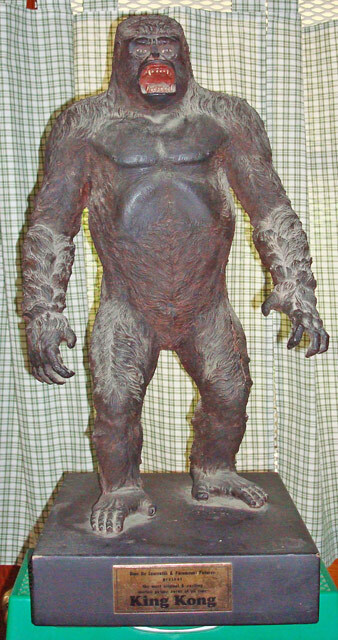 Well, no: in one of the most boneheaded and incomprehensible moves I've ever seen a seller make, they ended the auction early and re-listed it as simply "rubber gorilla"! No "King Kong", no "Bullmark", no "Takara", no "Mego". Nope, "Rubber Gorilla" will do just fine. Thinking the seller (who was new to Yahoo, btw) might be trying to avoid me by making these changes (and perhaps may have blacklisted the account), I bid with another ID, and won for a measly 1,800 yen. I tell you, stuff like that makes you forget (at least temporarily) all the heartbreaking auction losses you may have suffered over the years. With another "grail tale" related, it's time to talk more about the toy itself. Well, it's about 7" tall and articulated only at the shoulders. The launcher in the stomach is completely insane, inappropriate, and all the more awesome for it. I have no discs and it looks like it wouldn't work anymore anyway, but still it's great just to know such a thing was made. Since this is made by Bullmark, my immediate assumption was the it was simply a vinyl toy, but to hold it in your hands says otherwise. While the arms and legs feel like vinyl, the torso had a definite plastic feel to it. That disappointed me a little bit, but I love the gimmick and the sculpt so much that I'm able to look past it. 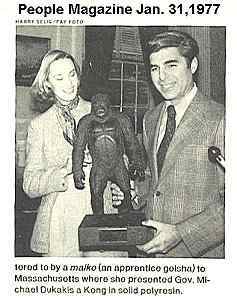 Speaking of the sculpt, if you read that thread I linked earlier, you'd know that the general thinking is that this may have been based at least in part on a very rare 2 foot tall statue that was sent to theaters to help promote the 1976 King Kong film, as the faces look quite similar. 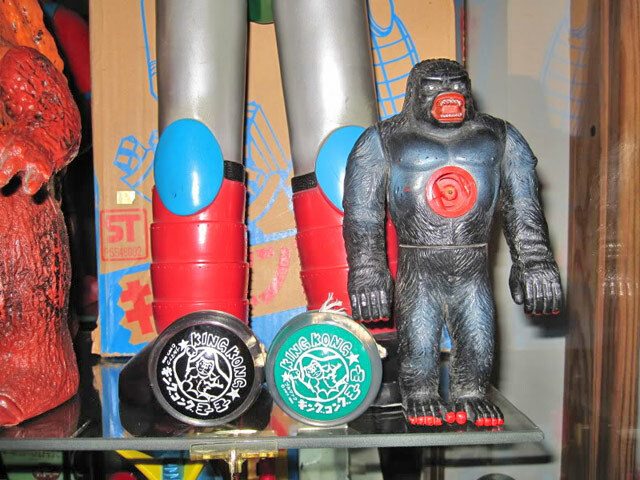 Of course, you'll also have seen that in addition to this toy, I also managed to snag those two Bullmark King Kong yo-yos shown in that catalog image. I will spare you guys the "review" of them. I still need the regular, "non-spinner" version, though. The hunt goes on... . I'm drawn to the painted nails. This will never leave my nightmares. Were you worried that asking around might jack up the interest and the prices? Especially since this seemed to be a previously unheard of toy? I love that there was a story behind aquiring this. I like hearing stories like that. Makes it much more fun to read about something I may not be into and makes it all the more interesting. Great score! @japester.. no, I didn't really worry about that, mostly because my monster collecting is something that I enjoy but don't obsess over. I'm much more guarded when it comes to machinders. I want to repaint one of these in neon colors.